Angela Hewitt is widely acknowledged as one of the great pianists of the age. Gramophone Artist of the Year in 2006 and the recent subject of a week-long artist focus on BBC Radio 3, her frenetic concert schedule and expanding discography bear testimony to her extraordinary talent and energy. Hewitt’s legion of fans will be delighted at this eagerly awaited second volume of Beethoven sonatas. Her first release in this series (see below) was fulsomely praised for its ‘clarity, intelligence and elegance’ … ‘fusing poetry and passion’, and all these trademark qualities of her playing are fully present in this second disc. 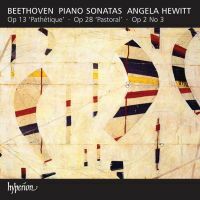 Angela presents three very different works here, written within a period of seven years: the enchanting ‘Pastoral’ Sonata Op 28, the monumental ‘Pathétique’ Op 13 and the dazzling early masterpiece Op 2 No 3. Her interpretations are vividly personal, yet the voice of the composer speaks clearly throughout.